In Cantares Mexicanos Rhythms, students recreate ancient Aztec musical phrases with syllables and fractions — please also see my introductory page on Aztec music. 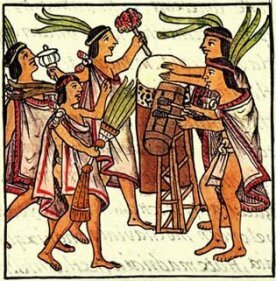 Your students learn seven Aztec rhythms: three of them with ocarina accompaniment, plus four more rhythms that form a drum spectacular! Each rhythm is taught using Aztec drum syllables, and is translated into musical notation and pie fractions! During the activity your students participate in an Aztec percussion group, and their role is to play the shakers. In addition to shakers, Phil and Sarah also suggest a variety of popular classroom instruments that will extend your students' learning — please see below. In the Cantares Mexicanos Rhythms activity package, Phil and Sarah provide you with everything you need to present an engaging musical activity that compliments your school’s standards-based Mathematics curriculum! You get Phil’s full-length introduction on how to play the rhythms, along with three versions of the music that you can play from your computer, or burn to disk using Windows Media Player or iTunes. Phil includes the same music and visuals he uses when he presents this activity at his popular Musical Fractions family nights. During his family nights the students each bring a rinsed soda can, and Phil brings the popcorn and rice. He puts one spoonful of popcorn and one spoonful of rice into each can, and covers the opening with a square piece of duct tape — that’s it. Now every student owns a shaker! After learning a couple of playing techniques, the kids perform the three rhythms on the Aztec Drum Rhythms page, and then segue into four more exciting rhythms in a drum spectacular! To hear a sample of the music with Phil's voice-over track, press the play button below — it will begin playing as soon as the file is completely loaded. It’s perfect for classroom teachers, music teachers, math specialists, history teachers, drum circle facilitators, or anyone else who has a love of rhythm! The entire package (including lesson plans, music, and visuals) costs only $24.95. To download Phil and Sarah's complete package containing two PDF files and four MP3 files for the "Cantares Mexicanos Rhythms" activity, click the "Buy Now" button below. 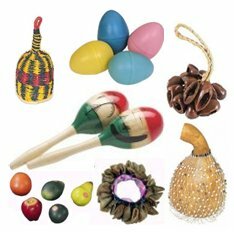 In this activity we will feature the various shakers and rattles that would be found in a traditional Aztec percussion group. Any instrument that produces a shaking sound will qualify. Many music teachers already own egg shakers, fruit shakers, and maracas — these work quite well. If you own any other unusual or interesting instruments in your collection, feel free to make them part of your group to add a characteristic sound. Once your students demonstrate proficiency with the rhythms, have them extend their learning! Students can play hand drums the same way that Aztec drummers played the huehuetl. Djembes, congas, or any other drums can be used to enhance this activity. Simply have them match the low and high tones for each rhythm. Incorporate Boomwhackers®, Orff instruments, or our homemade fraction tubes into your percussion group using the pitches C (low) and F (high). These pitches exactly match the teponaztli part. To use Boomwhackers, have your students play the tubes by lightly tapping them against their legs. Give your students the ocarina melodies to play on their recorders — all of the songs are tuned to play on a student soprano recorder (or any of our homemade instruments), and the sheet music is included in this package! Cantares Mexicanos: Songs of the Aztecs Translated by John Bierhorst. Stanford University Press; 1985. Music in Aztec and Inca Territory by Robert Stevenson. Berkeley and Los Angeles: University of California Press, 1968. Second edition, 1976.